Commerce is the foundation of human society. Before the churches, before the schools, before the other public institutions, there were businesses. The exchange of goods and services is the force that keeps human society functioning. Understanding the goods and services available to our ancestors at a given time is the essence of understanding the culture in which they lived. Understanding the businesses that could have employed any of your ancestors is also part of knowing the world they lived in and the options and opportunities they had in their lives. We will be very pleased to receive business histories and photos for inclusion in this section of the Tri-Counties Site. From the one person operation to the billion dollar corporation, if they are part of this area and its history, we want to know about them and preserve their memory. 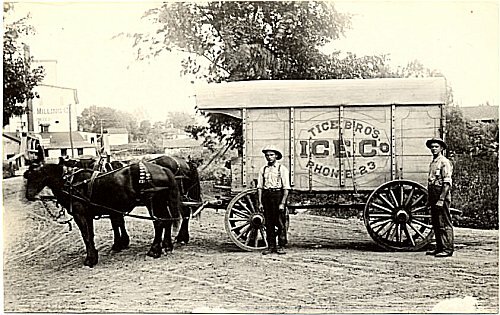 This postcard of Tice Bros. Ice Co. is from the MidWest, not our own area. It was sent to me by a person years ago and the business page seems a good time to finally display it. Do you have articles or business histories you would like to submit for inclusion here? 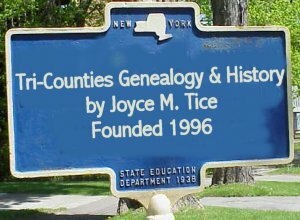 Contact Joyce at above Email address.